Are we all capable of searching and finding the things that matter to us most? 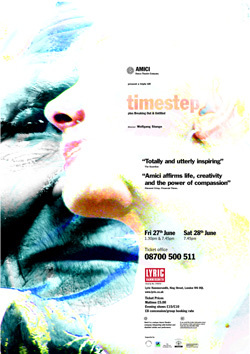 "Timestep is a highly theatrical performance of cabaret spectacle and colour, swirling around the cyclical nature of time passing." All the AMICI members tell this extraordinary story with flashbacks, dream sequences, narration and music. Choreographed by AMICI and Wolfgang Stange. "Not one to be ignored, Bill confronts us confidently with an exploration of barriers to fulfilment; the hindrances, frustrations and grievances of living within a disabled body." "Untitled is a beautiful, simple work consisting of a flowery swirling mass of performers moving in linear formations similar to stately court dances. With skipping in circles and whizzing wheels, the structure of shape, pattern, music and friendship is explored. The enjoyment of the dancers is almost overwhelming, their pleasure and delight in performance radiating into the auditorium."